My blog post for my stop on the blog tour for ‘A Thimbleful Of Hope’ is slightly different to the majority of my blog tour posts as it comes in two parts. The first part (this part) contains my review and the second part contains an interview with Evie Grace herself. Dover, 1864: Violet Rayfield leads a happy life with her family in a beautiful terrace on Camden Crescent. But Violet’s seemingly perfect world is shattered when her father makes a decision that costs her family everything. Now Violet must sacrifice all she holds dear, including the man she loves. As Violet strives to pick up the threads of her existence, a series of shocking revelations leaves her feeling even more alone. But where one door closes, another opens, and the embroidery skills Violet perfected while a young woman of leisure win her vital work. I have been a fan of Evie and her books since I picked up her first book called ‘Half A Sixpence’ which was released nearly 18 months ago. Time has certainly flown. I eagerly devour (not literally) each book that she releases and then I impatiently start the wait for the next one. Well ladies and gents the wait is temporarily over because ‘A Thimbleful Of Hope’ is due for release on 10th January 2019. I was lucky enough to have sight of a review copy and I absolutely loved it but more about that in a bit. The main focus of the story is a young lady called Violet Rayfield. We first meet Violet in 1864. She lives with her family comprising of her parents and her sisters. The family are comfortably off but they certainly aren’t millionaires. Violet is kind, gentle, feisty, determined and she can occasionally be very stubborn. She is on the brink of adulthood and she is about to go to her first ball. Violet has blossomed into a beautiful young woman, who is turning heads wherever she goes. She has had a bit of a sheltered upbringing and she can be naïve. There is a massive bump in the road for the Rayfield family and life will never be the same for Violet, her sisters and her parents. Violet’s father makes a decision, which leads the family to lose everything. Violet has to then make a lot of sacrifices, including leaving behind the man she loves. I took to Violet from the start and when things started to go wrong for her, I couldn’t help but want to jump inside the pages of the book to give her a hug and to reassure her that all was not lost. I couldn’t help but keep my fingers and toes crossed that everything worked out for her in the end. Does everything work out well for Violet? Well you are just going to have to read the book for yourselves to find out as I am not going to tell you. As is the case with Evie’s other books, ‘A Thimbleful Of Hope’ is a superbly written and superbly researched book with an excellent attention to detail. I have some knowledge of that era through my college studies so I knew some of the detail but not all of it. I certainly felt as though I had learnt something. Evie uses such powerful, vivid and detailed descriptions that I really did feel as though I had been transported back in time with all the relevant sights, sounds, fashions and so on. The Victorian era fascinates me. I was hooked on this book from the first word onwards. Evie Grace has a writing style that entices you in and doesn’t let you go until you finish the book. That’s how I felt anyway. It was almost as if the book had cast a spell over me. I binge read the book over a couple of days because I found it very hard to put the book down. I was so into the author’s writing style, the characters and the storylines that the book seemed to come alive and I felt as though I was part of the story. I just had to keep reading to see what fate had in store for Violet and her family. By the time I finished the book I did feel as though I had been through a bit of an emotional rollercoaster ride with lots of ups, downs, shocks and surprises so on and so forth. 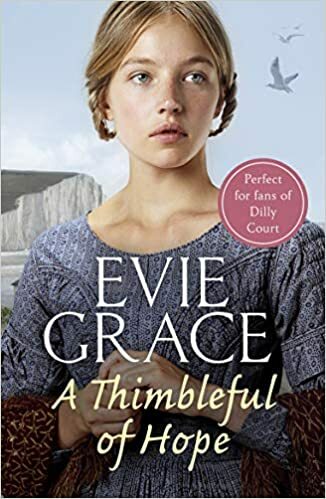 In short, I absolutely loved ‘A Thimbleful Of Hope’ and it’s safe to say that Evie Grace has a bestseller on her hands with this book. I have thoroughly enjoyed every single one of Evie’s books and I can’t wait for the next one. Fortunately I don’t have too long to wait because the next book is called ‘The Seaside Angel’ and it is due for release on 11th July 2019. The score on the Ginger Book Geek board is a very well deserved 5* out of 5*.